Dev Note: This change should better reflect the fact that the higher Legendary Ranks are not as powerful as early Ranks, stopping the Underdog buff from penalizing higher Legendary players. Happy New Year, EpicDuelists! Here's to a new year with new beginnings, new challenges, and new triumphs! 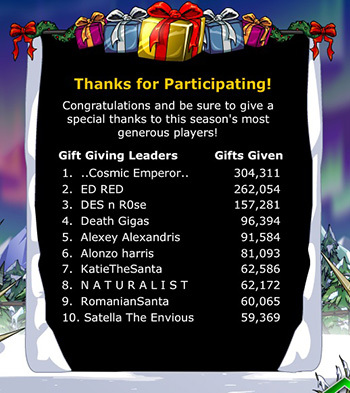 I'd like to congratulate our Epic gifters this year who blew away our expectations for generosity, especially ..Cosmic Emperor.. who received my very own Founder Armor! Wear it with pride! Thanks again to everyone who participated in this event, even if you only gave one gift or just did something nice for a fellow player. For the first update of 2017, which should arrive tomorrow, we'll be making a few changes. 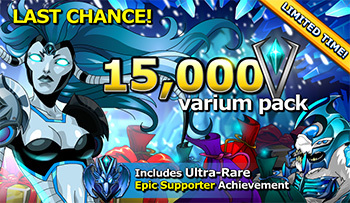 First, and most noticeable, we'll be reverting the 15,000 Varium package back to 12,000. As soon as we update, you'll not be able to earn the Ultra-Rare Epic Supporter Achievement again, so if you've been on the fence, now's the time to act! We'll also finally be removing the BioBeasts packages from the shop. The promotional items, including their cores, will also be removed from their in-game shops on Galatea and the Monkakazi until September 18, 2017, when they will be available for Credits as well as Varium. When we update, we will also reactivate the War, which should resume at Central Station. There will be a brief delay before the War region officially activates on Monday to make sure everyone is aware and prepared for it. Wars have been updated to have a shorter cooldown between, unlike the variable cooldown times of before which could stretch for months. We'll also be addressing some balance issues with this update, including First Strike, Underdog, and Legendary Ranks! What's on the agenda for 2017? We've been meeting with Artix and other team leads to determine the best direction to proceed for our personal growth and the good of the entire company. We'll post a Design Note concerning the outcome of those meetings tomorrow after the update.